@JerrySketchyArt My feedback: I like the palm the best, really detailed with great stroke. I like the palm better than the house. I think the house is missing little details, the facade in the first and second floor has strokes like for smaller house, to strong in my opinion. I don't like the black trees on the first roof, I think bright sketchy and some better design would be better. The windows are bit to much rough with the big lines. More details would make it better. The best part of the house is the second roof. It is fine detailed on the facade -this facade I would make on the whole house. House wise I am distracted by the two types of lines you have. The outer lines are accurately straight but then your inside detail lines are free hand (I concluded), I like it to be consistent. Drawing straight lines digitally is hard for me too but I rather draw freehand all for final works. *Now I could be terribly off and you have hand drawn them but point remains (windows are wiggly and walls are straight). Something I like: Those doors and windows certainly do give us a sense of scale. Lots of neat little details. Something I'd change: The silhouette feels unbalanced (feels to me like it really wants to fall over to the right). I would either shift that top floor further centre, or extend the base floor to the right. Something I like: That tree is awesome. You've got that form shading with the edge of the leaves down pat! My stab at the house part of exercise #4. Trees are a lot easier for me -I will take a stab at the iso diagram version for this. That was last on row 1. Not perfect but finished. Now I haven't been on week 2 -spoilers -now I can! @Braden-Hallett Now I know some of my issues but feedback is good too. Had some issues with roof tiles specifically and it was far more challenging doing the isometric version - but was able to put How To Draw Everything course more into practise. Thanks and anybody else is always welcomed to comment. @Heather-Boyd Hey, I'm still going to give a little feedback. On the side view, it looks like the roof is passing the wall, while on the top view it looks like the roof stops where the wall starts. From this angle I was expecting the roof to cover a little of the window. Love your work by the way. I wished mine could look so clean. @murielle That's a good catch thanks, that's an easy fix. I worked on Worksheets 1 and 2 again after I watched past 50 minutes on the Reference Video to create them from my head mostly with a bit of help from the shapes I found in my house. I started and finished these today. This time please let me know which ones don't really meet the 3rds and/or 5ths Rule - some are more natural and others I had to stop and see if they were working with the rule. @Braden-Hallett and everyone else always appreciative. Some of those tree shapes are super neat. I particularly like the three in the second row that are growing near/on cliff faces. I think with the trees I may keep in mind balance. Throwing some small objects on the other end of the teeter totter to help balance out some of the big swooping flowing shapes. @Braden-Hallett My mother agrees, we call that particular one the woman with swooping hair. I like my trees with personality and attitude. Now when you say small objects -do you mean as part of the tree -branches or other elements - which I tried to do with the cliff? Thanks -my free choice are birds far more challenging for me. 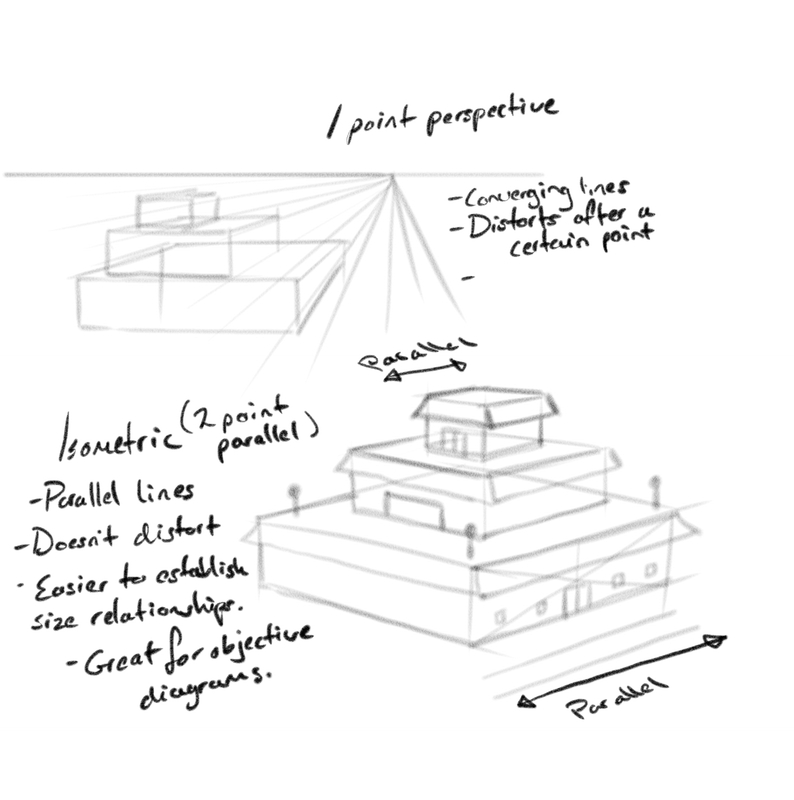 Nice work with the isometric perspective! @Braden-Hallett Yes I tried to balance it better with chimney weight. Thanks for your thoughts. Free choice - birds - a bit more tricky. I think next week will be my week 2. This was a tough week my father started his depression and anxiety classes and his mother just passed early this morning, she was 92.